Here's one of the stills from Reservation Road. 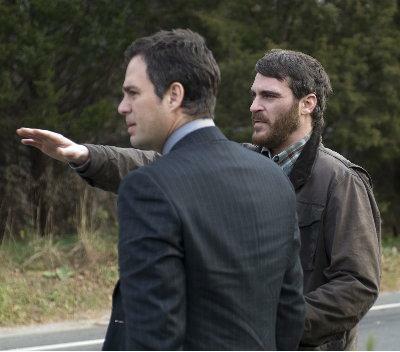 I'm sure there will be more, but its strange seeing Joaquin Phoenix and Mark Ruffalo cooperating here. After all, Mark accidently killed Joaquin's child in the film. Is this all plausible? So how could these two men be communicating with each other directly? Ethan is played by Joaquin, with his armed outstretched. Dwight is played by Mark, likely looking at the scene of the crime. "Two haunted men and their families are engulfed by the emotions surrounding an unexpected and horrendous death. Ethan, a respected professor of literature at a small New England college, is wracked by an obsession with revenge that threatens to tear his family apart. Dwight, a man at once fleeing his crime and hoping to get caught, wrestles with overwhelming guilt and his sense of obligation to his son."